Hope totaled 94.5 points between women’s and men’s sports during winter and fall competition to lead second-place Calvin by seven points. The rest of the MIAA Commissioner’s Cup standings have Albion and Kalamazoo tied for third with 57.5 points, Trine in fifth with 54.5 points, Alma in sixth with 51.5 points, Olivet in seventh with 48.5 points and Adrian in eighth with 48 points. 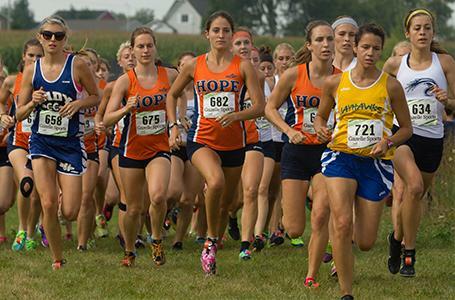 In the women’s standings, Hope is in the lead with 50.5 points after finishing second in women’s basketball and women’s swimming & diving to Calvin this winter. The Flying Dutch are 6.5 points ahead of Calvin. They are followed by Albion and Kalamazoo with 28 apiece, Alma with 27.5, Olivet and Trine with 22.5 apiece, Saint Mary’s with 21.5 and Adrian with 19. In the fall, Hope earned titles in women’s golf and women’s soccer, tied for the volleyball title and took second in women’s cross country. In the men’s standings, Hope is in first with 44 points after taking second in men’s basketball and third in swimming & diving this winter. The Flying Dutchmen are one point ahead of Calvin. They are followed by Trine with 32, Albion with 29, Kalamazoo with 28, Alma with 27.5, Adrian with 29, Olivet with 26 and Alma with 24. In the fall, Hope repeated as men’s golf champion, finished runner-up in men’s cross country, placed third in men’s soccer and tied for fourth in football.